Is Christmas driving you crazy? * 1. Schizophrenia — Do You Hear What I Hear? * 5. Manic – Deck the Halls and Walls and House and Lawn and Streets and Stores and Office and Town and Cars and Buses and Trucks and Trees and…..
* 9. Attention Deficit Disorder — Silent night, Holy oooh look at the Froggy – can I have a chocolate, why is France so far away? Yes, it says “Chris &amp; Critters”. In HTML, if you want to write “Bob & Nancy”, you can’t just write the “&” directly, because it has a special meaning to HTML: it begins a character entity reference. In your HTML source, you have to write it as: “Bob &amp; Nancy”. The browser will show this as “Bob & Nancy“. Well, someone at HeavenlyHam.com had the tedious task of hand-writing all the Web-form-submitted holiday greetings to include in the shipments of delicious goodies. This unlucky person didn’t translate the “&amp;” back to “&“. Which amused me immensely, because I: 1) am a web developer, and 2) am easily amused. Sweet Lord, my Genetic Algorithms course has ended. The giant pile of work is now behind me. I have to say that despite the large amount of work, the course has been one of the most rewarding in recent memory. There are a lot of exciting ideas in this field. The course instructor is David E. Goldberg, who is an influential luminary in the field. 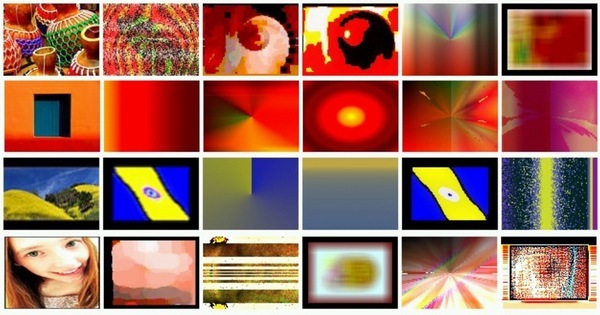 The picture on the left is the Flickr image that the generated images resembled most. Lower numbers mean higher rankings. Look at 392. The demon got 4th place! Maybe that’s why he looks angry. UPDATE: Click here to see some giant tiled montages of artwork generated by the technique. 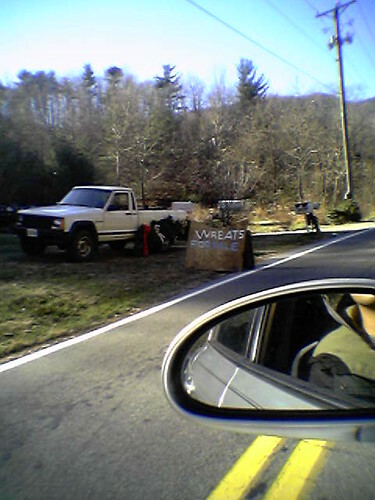 "Wreats" for sale. This is at the same house that has the yard full of roaming chickens, junked cars, and the annual appearance of what we like to call the "Septic Snowmen". Verizon’s complex billing schemes for phone services are hard for us to understand. Why not return the favor? When I was a kid, I spent a fair amount of time recording songs off the radio. That was back in the cassette tape days, when the only music piracy you could enjoy was whatever you could rip off the airwaves onto your hissy little boom boxes. The ones that would occasionally eat your tapes, chewing up the precious magnetic strips of musical goodness. You’d spend hours rolling the tape back into its plastic housing, unfolding the Gordian knot as you went, eager to preserve the now warbly-sounding once-glorious musical treat. If the above Flash player doesn’t work, try this direct link. I’m dying to know the name of the artist who composed this song. Does anyone have any guesses? It’s been bugging me for many years now. The song sounds a bit dated and cheesy today, but I credit that song for diversifying the dominant influences of metal and skate punk on my early teenaged musical interests. Metallica, Anthrax, and Suicidal Tendencies began to make room in my stereo to co-exist with artists such as Jean-Michel Jarre, Kitaro, and Wendy (formerly Walter) Carlos. Nowadays I listen to large swath of musical styles, including many genres and sub-genres of electronic music. I’ve never stopped enjoying the discovery of new music. Life would be pretty drab without it!